In chapter 6 we read Jesus’ teaching about giving to the needy, praying, fasting and the danger of making money your master. Then in verses 25-34 Jesus addressed anxiety right after he got done talking about money. -what you will eat or drink and what you will put on. There’s more to life than food and clothing. Life’s meaning doesn’t depend on what you eat or what you wear. Worry doesn’t benefit your life (v.27) and which of you by being anxious can add a single hour to his span of life? It’s been proven that anxiety can truly shorten your longevity in life. Jesus is giving us reason why we should not worry or be anxious. 1) You have a heavenly Father. You should not worry because of who your heavenly Father is. He values you over his creation (you are more valuable than birds). Early fathers sometimes value their jobs more their kids, or value their pets more than their kids. You are more valuable than animals to God. You are more special to him than the rest of his creation. b) He clothes the grass of the field (28-30) God clothes the grass you see in the field and he will also clothe you. 2) To worry or be anxious in life is to lack faith. (30) O you of little faith. -being anxious is showing lack of faith. Lack of trust in God as your heavenly Father. In other words, you worry or become anxious because you don’t trust God. Worry and anxiety comes when you turn from God; you shift focus. Are you looking at the situation rather than focusing on your Heavenly Father? Our Heavenly Father takes care of the birds and clothes the grass in the field. He will take care of you, his child, his special creation, HE is asking you to trust him. Instead of being anxious Jesus tells us to seek God’s kingdom and his righteousness first. Jesus is challenging his followers to examine their priority in life. Sometimes we claim to have God at the top of our priorities, but when we look at our values, our commitments, our money, time, how much of it is dedicated to God’s kingdom? Jesus promises to take care of those things that cause you worry when you seek him first. Jesus promises provisions for kingdom people. As a follower of Jesus if you struggle with anxiety in life, listen to Jesus’ word. Don’t worry about your life, but trust the one who knows your needs. When you are anxious, you are not trusting God to take care of you. Don’t worry about tomorrow, for tomorrow will have its own troubles. Don’t worry about your life, but become a kingdom person and he will take care of you. But seek first the kingdom of God and his righteousness, and all these things will be added to you. The cure for worries and anxiety is to trust God. 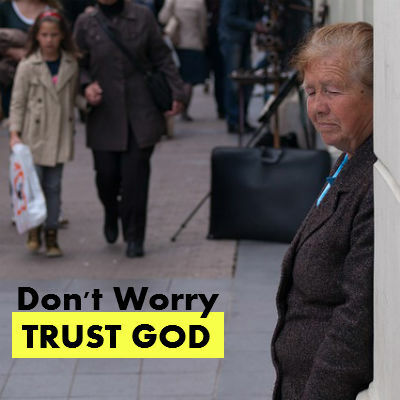 When you trust him you are not worried and when you are worried is because you are not trusting him at that moment.